As I turn another year older, I must say that celebrating a four-decade milestone was much more fun, exciting and emotional. Now, I’m just another year older. Blah! 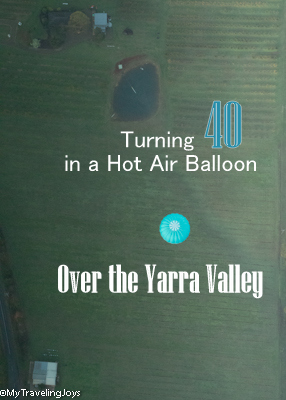 Weeks before we left Australia, I wanted to do something special for my 40th birthday. 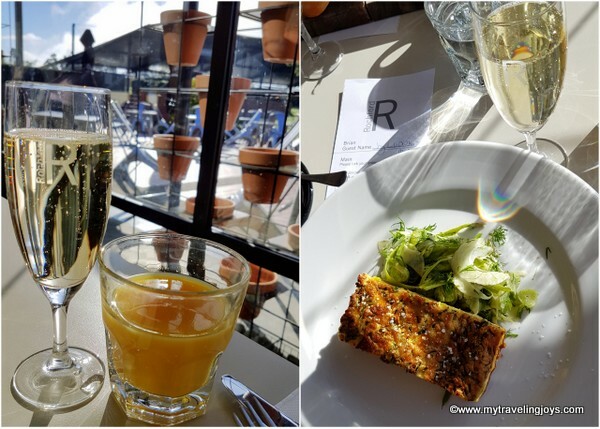 I did all the planning and decided that floating over the beautiful Yarra Valley and drinking local Aussie wines sounded like a perfect fit. But then on the night before my birthday, the hot air balloon company called to say the conditions were too windy to go up early the next day. (Hubby consoled me with a wine dinner at a winery so I can’t complain too much.) Then, we rescheduled for another weekend, which also was cancelled due to wind. Finally, the third time was a charm for us and up we went into a misty autumn morning. 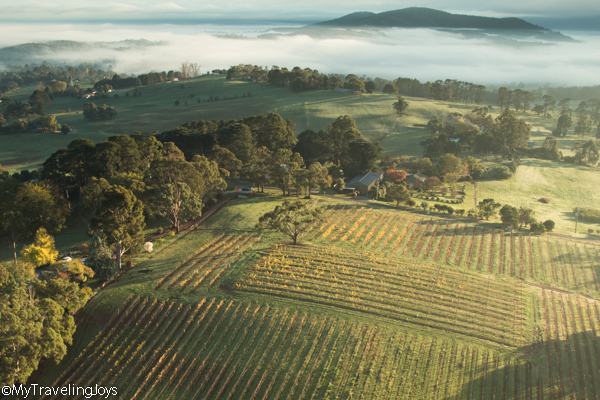 The Yarra Valley is located about an hour from Melbourne’s CBD area. 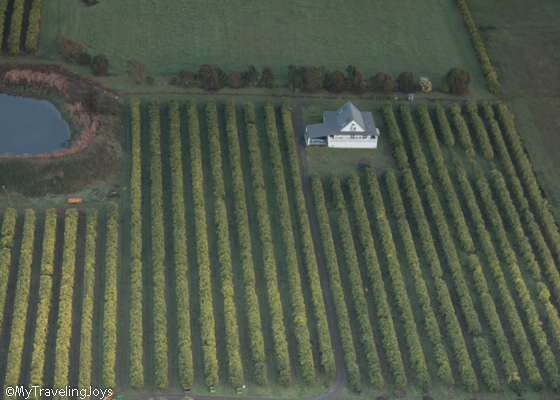 Previously, we already had taken two wine tours in the valley and one DIY winery tour. 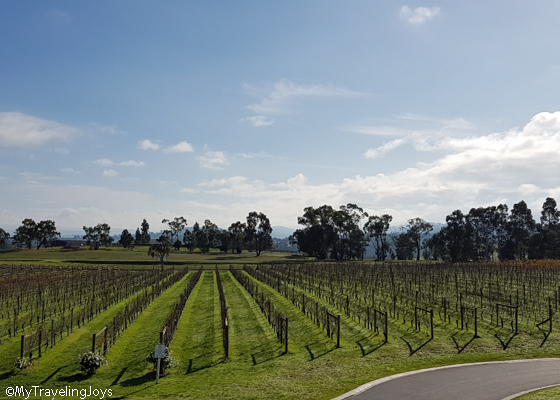 I had fallen in love with Australian and Kiwi wines and the valley happens to be the closest wine-producing region to the city. Wine + beautiful landscapes = one happy girl. 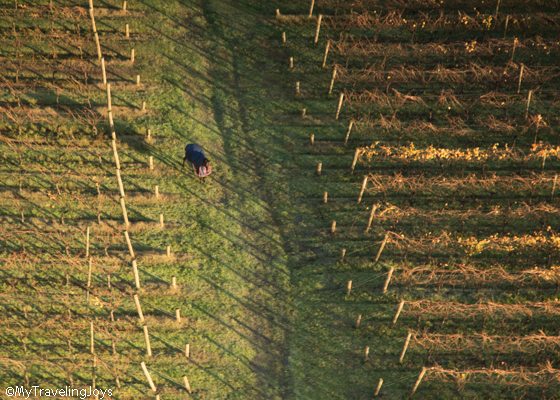 A horse and its shadow amongst the autumn-hued vineyards in the Yarra Valley. 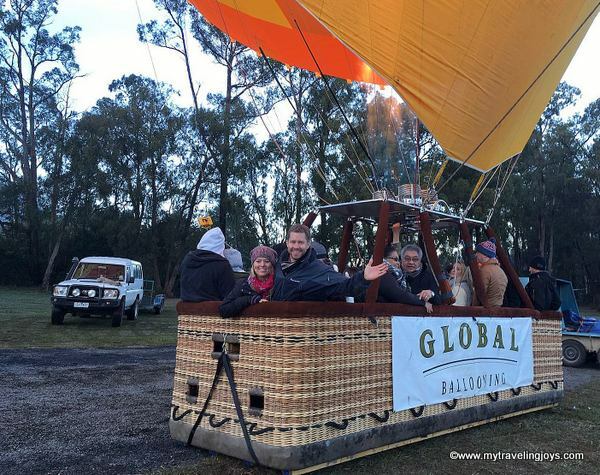 On the big departure day, we opted for the free shuttle bus ride via Global Ballooning from Melbourne to the valley’s meeting point. We arrived a little after 5 a.m. The sky was still pitch black and we were surrounded by a low misty fog. I was worried the balloon ride would be cancelled yet again! 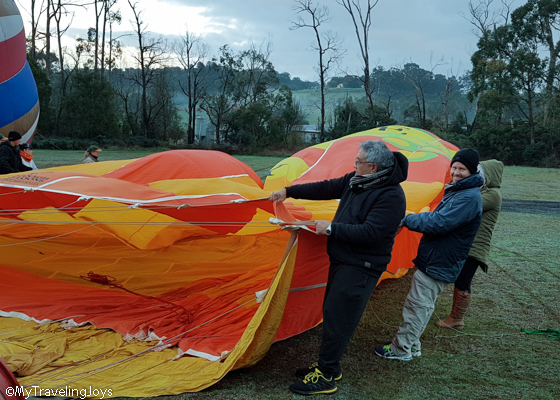 After driving to an appropriate landing site, our group got out to help set up the hot air balloon. Three other balloons took off from the same site, so it was fun to watch everyone prep the balloons. I mainly stood back and took photos. Ha! Hubby and me before we took off on our Global Ballooning adventure. 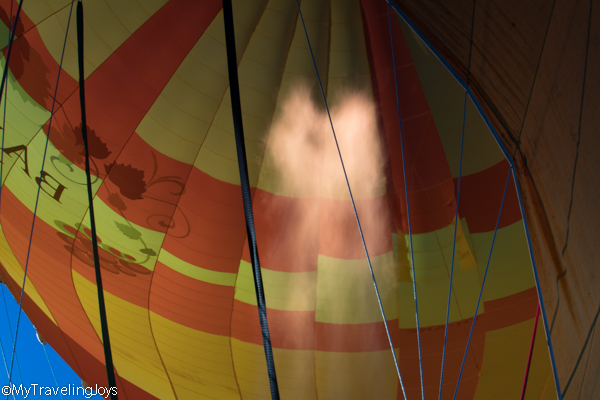 I should mention that I’m a teensy bit afraid of heights, and I started to mildly panic once I hopped into the balloon’s basket. However, once we got up in the air, the feeling was magical. Any fear subsided and all I did was admire the beautiful scenery around us and take more photos. 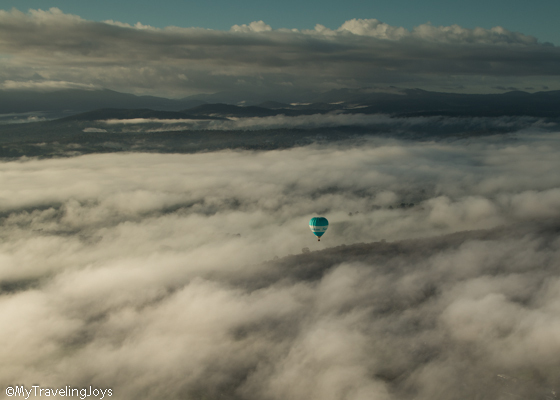 We literally floated through and above the clouds! What a delight! 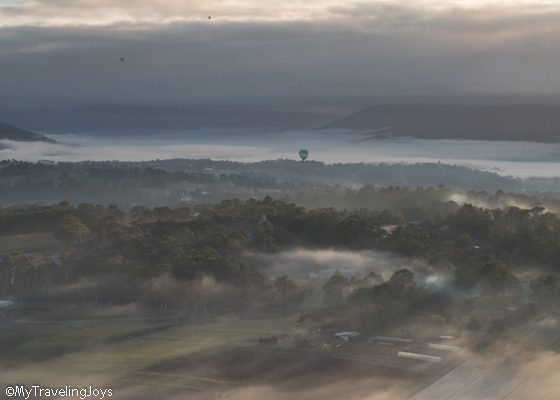 We silently floated over Victorian farms, apple orchards, wineries, emerald-green pastures filled with cows and horses and even a couple of kangaroos. Seriously, the views could not have been more perfect! 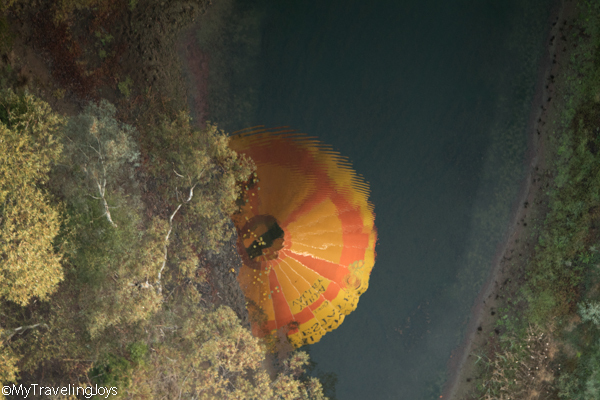 Why had I waited 40 years to take this thrilling balloon ride? 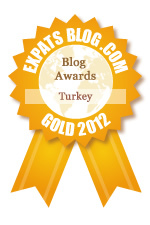 When we lived in Turkey, we almost did a balloon ride over Cappadocia, but opted not to because of the expense. Now, we were paying nearly twice as much in Australia, but the cost was certainly justified in the end. 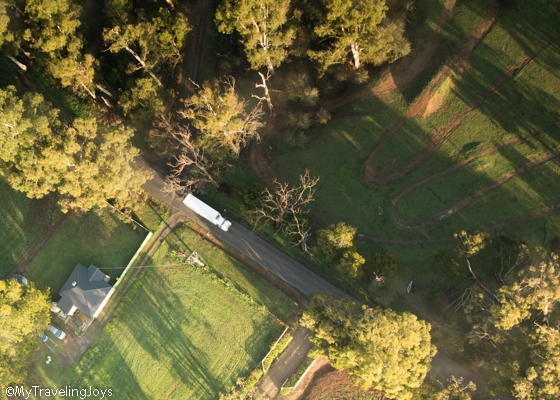 After an hour or so up in the air, we landed in the middle of a pasture filled with cows who didn’t seem to mind our intrusion whatsoever. 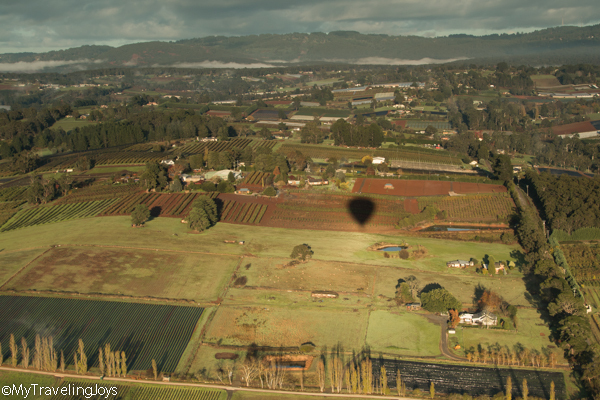 The company has partnerships with several local farmers who allow the balloon companies to land there. Then, we all helped roll up the balloon and gather the supplies so we could head to breakfast. 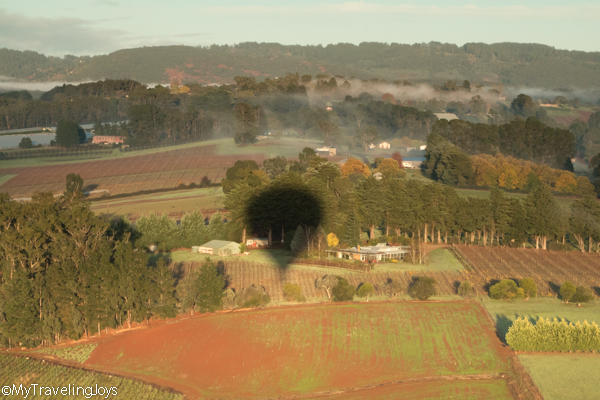 Our balloon package included a fantastic brunch at Rochford Winery with lots of sparkling Aussie wine. Hooray! Plus, we had a good time chatting with our Aussie neighbors who were planning a big trip to the U.S. I was more than happy to provide my foodie recommendations for NYC. All in all, turning 40 wasn’t too bad. I may have shed a few tears, but in the end, I made true memories to last a lifetime by floating over the amazing Aussie landscape. happy birthday joy! what an experience! i am way to scared of heights to do that! Life lesson from Cappadocia...don't skimp on one time experiences...but haven't given up on going back to correct that error. I wish I was brave enough to try it - not sure the panic leaving the ground would be worth it. @Sherry,yes it was magical, but we had a very smooth landing. Luckily!